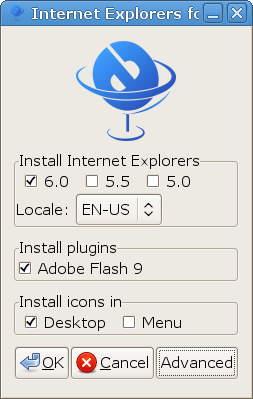 Many people are reporting this problem to me lately: when using IEs4Linux with recent wine versions (>=0.9.52), the ie toolbar disappear and others display bugs happen. Here is IEs4Linux 2.99.0.1 that fixes only this bug. It’s an emergency release since 2.99.1 is not ready yet (as you know I’m late with this due to recent personal problems). I’m now finishing 2.99.1 that will have a lot of improvements and much better Mac compatibility. Dan Kegal sent this to the Wine-Devel mailing list today. (before failing in msi later)." apparantly Novell thinks it helps Groupwise a bit. 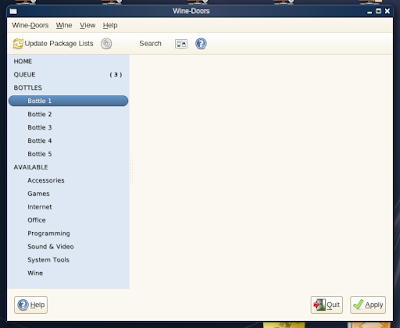 Shortly after this e-mail Dan sent another mail announcing that he has now included a GUI for winetricks within the script. 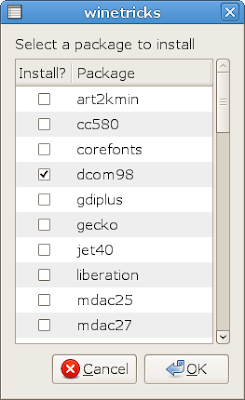 gui-from-shell tool is appropriate for the current desktop. or the like to get help. I must admit being a bit skeptical when first hearing about Crossover Mac. For many years I have tried various solutions to make my Mac run PC programs for both professional and gaming reasons. So often, so much was promised and so little delivered. I was even one of those fools that allowed my mother to be convinced to buy a Mac with a built-in PC emulator card in it. It was a useless piece of rubbish, the card that is, that couldn't run a bloody thing. What most convinced me to get in touch with the guys behind Crossover was their cheeky little video comparing their product to the other ways of getting Counterstrike 2 running for a bit of LAN party. Crossover naturally was the fastest. Anyone who loves FPS gaming, especially the online variety has a lot of respect for Counterstrike in its various forms. No purer form of multiplayer FPS exists and its no wonder its used frequently in the FPS professional leagues. A review copy was offered of Crossover Mac and I enthusiastically installed it on my Macbook Pro. The program is very easy to install and the set-up is quite easy; even for the most neophyte of tweakers. To my great surprised installing PC programs is just as easy. It takes you through the "bottling" process and sorts everything out for you in easy to understand ways. I first started off with a Counterstrike package to see if that worked alright. It would have been silly to spend that much on any other products in the series as the "Orange Box" was about to be released. For those of you who don't know the Orange Box consists of Half Life 2, HL2: Episode 1, HL2: Episode 2, the odd but fun Portal and Counterstrike 2. It is probably the best PC game value on the market. There is additional free programming associated with HL on the "Steam" online distribution system that is accessed quite easily with Crossover. HL2 and its offshoots all work very well indeed on Crossover. You might need a bit of tweaking with the set-up, but in no time you will find yourself blowing the smithereens out of the various nasties in the game. The pleasure of playing such a great game on my MacBook Pro knows no bounds. Crossover Mac runs a myriad of other programs as well, including other games and well as many other "serious" programs as well. 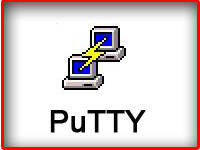 I understand that its quite useful to have this program if you do websites and don't have access to a PC. You can run IE on Crossover and check out how things work in that program. 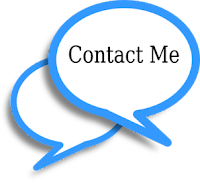 The Crossover site has forums which can help you determine if the program you want or need to run works with the program yet and how well it does. There are people continually trying out new things to see if they work with the program. I will be trying to see if I can get Hellgate:London running on it. Needless to say some of the high-end programs and games are probably not going to run on Crossover. 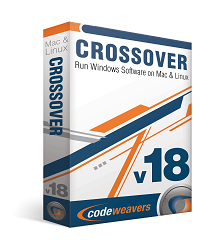 Crossover Mac is the program for you if you think Bootcamp is just a bit too technical for your tastes. Well done to Codeweavers for finally developing an easy solution to running PC programs on the Mac. Colour me impressed and I am sure the guys are hard at work on making this piece of kit even better. They do a Linux version as well.